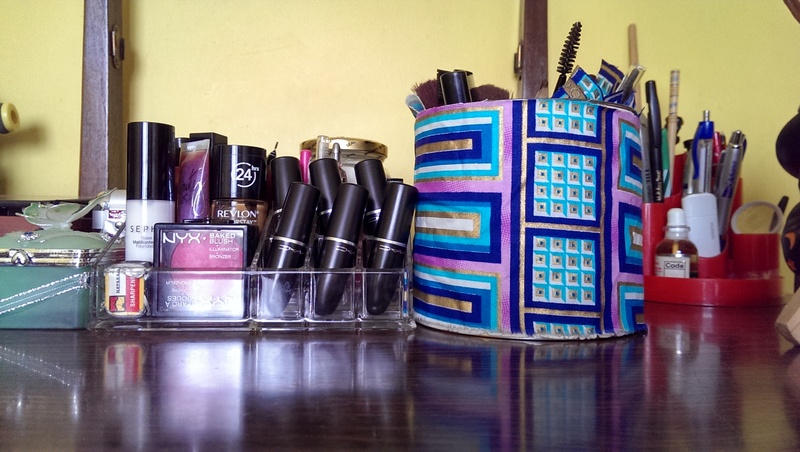 I’ve been wanting to do this post for a while now, and I thought it’d make more sense once I figured out a proper way to store my makeup. This post also probably serves as a way to DIY/upcycle your old items in a way that they can continue being used instead of being thrown away. In that way, you’re saving the environment while saving money. Win-win, right? Would you believe that the lipstick/blush/foundation holder is actually one of those desktop pen/stationery holder thingies? I was lucky enough to find this one lying around in the house. I immediately took it and transformed it into my makeup holder, along with my brush/lip liner holder that was an old tin used that I decided to use. I covered the tin with some scraps of fabric to give it a new lease of life and I think that did the job. 🙂 I’m sure you can find the stationery holder at either Seal Honey or Office Mart, not sure of the price though. Best thing about it is that it almost looks like the super stylish storage boxes from Muji. Hope this helps anyone interested in gathering ideas on how to store their makeup. Please let me know if you’d like a post on how I upcycled the tin.